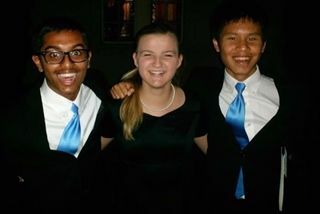 On November 21st, sophomores Anurag Aiyer, Rachael Bell and Christopher Ong performed with the Southern California Vocal Association High School Honor Choir during a concert at the University of Redlands. The students were directed by professional choral directors Angel Vazquez-Ramos (CSU Bakersfield) and Dr. Christopher Peterson (CSU Fullerton), and performed a variety of songs from contemporary pop hits to traditional Gregorian hymns. All three students have also been invited to sing with the California All-State Honor Choirs on February 13th in San Jose.